Aqua is a misty creation that recalls sweet summer days spent by the seashore. Constructed of silk embroidered organza with pleated tulle ovelay, this sweet little gown features floral embellishments in shades of aqua and soft peach, accented with the sweetest of ostrich feathers. 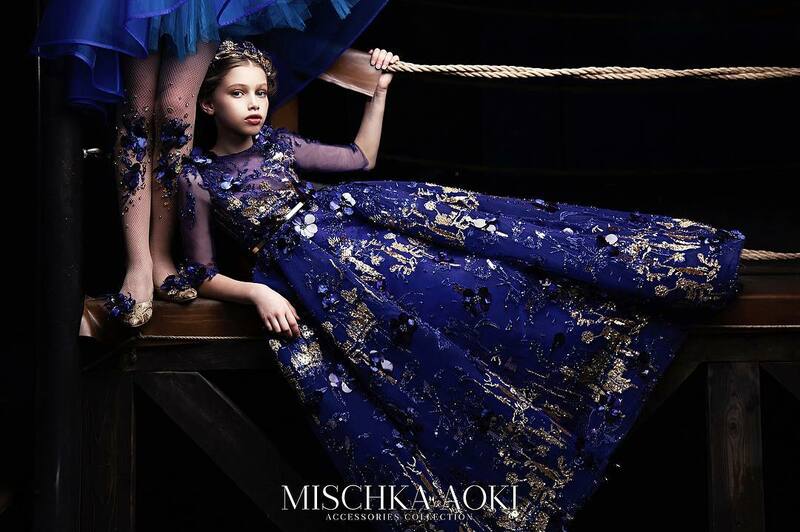 The empire waist, sweetheart bodice and flowing design evokes a goddess-like impression, and certainly, any little miss would feel ethereal in this gown. The fully adjustable straps and flexible back design makes this creation practical as well as beautiful, as it allows room for growth. Accented with genuine Austrian pearls and Swarovski crystals and removable floral shoulder brooch, Aqua is a divine confection of luxury that could be proudly worn by Aphrodite herself. 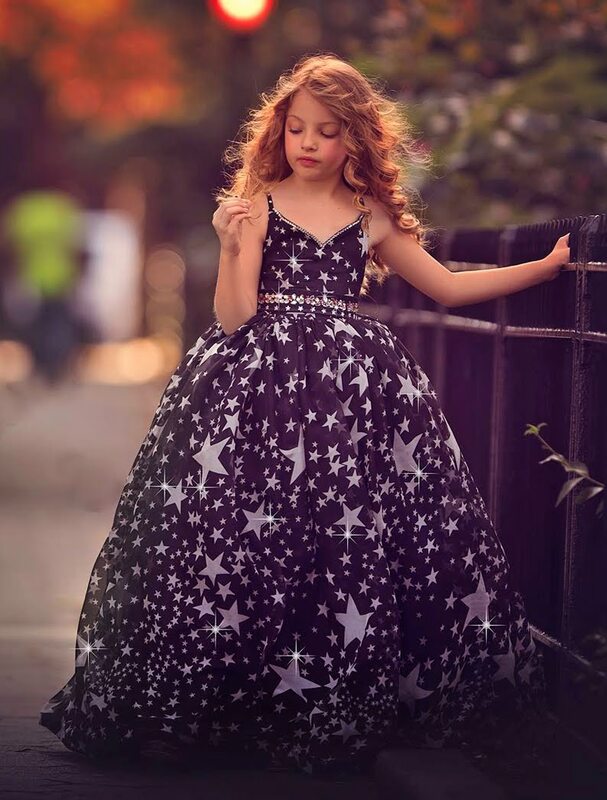 Gorgeous gown to make your little star shine bright! 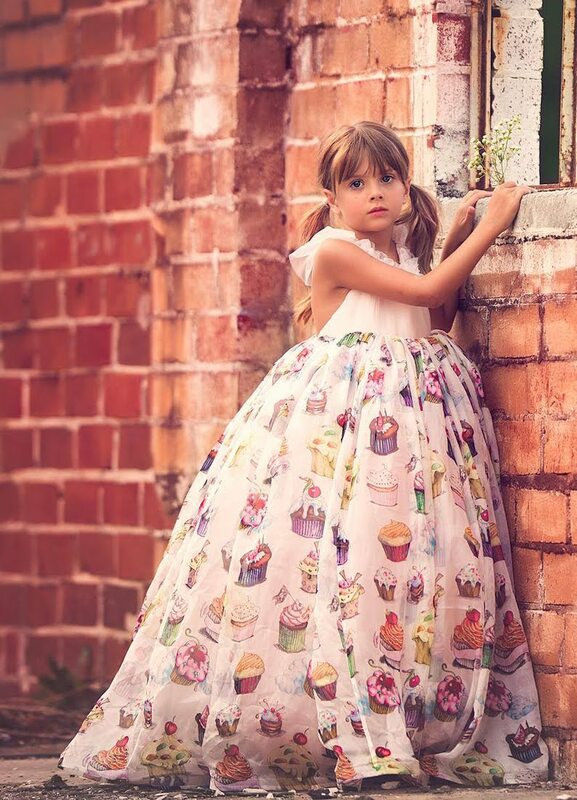 Features a higher-than-natural waistline, with sweetheart-shaped bodice, criss-cross straps, elasticized back panel, detachable sash with colorful rhinestones and stars, rhinestone accents scattered around the bodice and a gorgeous feather-light chiffon skirt with tulle underskirt. Beautiful "Marchesa" gown features a luscious bridal tulle skirt with layers upon layers of horsehair braid trimmed high quality tulle, 3d floral lace overlay on bodice, floral lace and feather accents on skirt. The gown was originally created in blush (shown), it can also be made in champagne with off white floral accents. 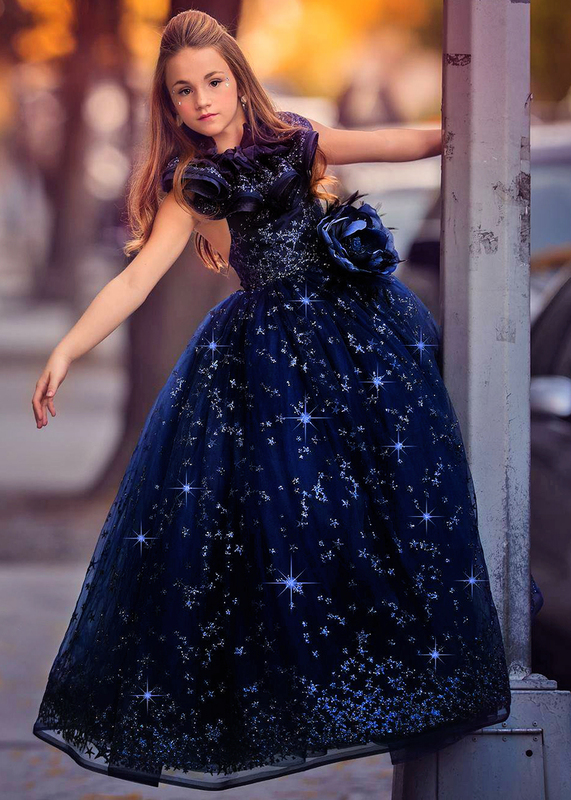 Made of stunning navy blue lace with glitter stars scattered all over, our "Luminous" gown is a piece that makes a loud statement. 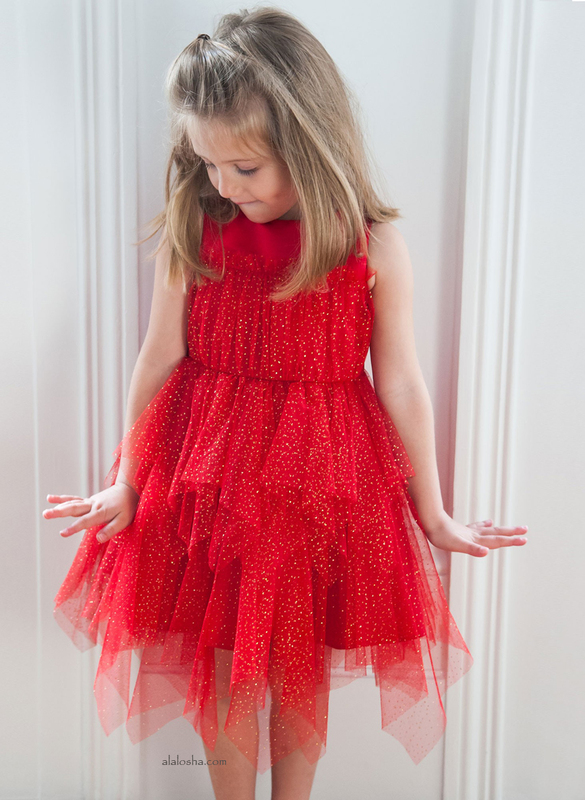 Adjustable bodice, overlayed with glitter lace, fits a range of sizes and will grow with your child. Long straps criss cross in the back and tie at waist. Glorious skirt is shaped with close to a hundred yards of tulle trimmed with horsehair braid on each layer. 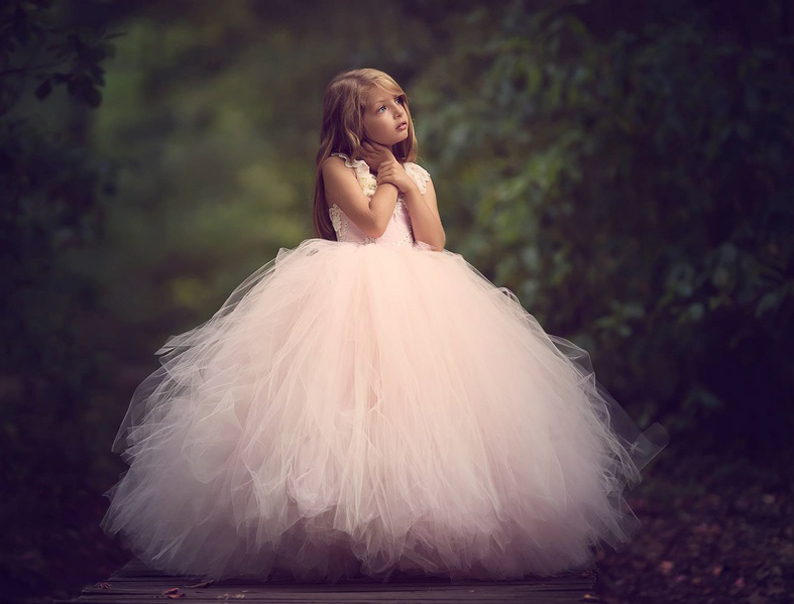 There's no need for hoop skirts or petticoats - the gown is as full as it looks.